In the Philippines, one of the world's longest running communist insurgencies is being worn down by the passage of history. On July 27, thousands gathered in Quezon City to protest during Philippine President Benigno Aquino III’s state of the nation address (SONA). The SONA protests are a recurring show of force for the Philippine left, the strongest left in southeast Asia. Every year demonstrators gather to denounce issues ranging from inequality and poverty, to human rights violations and corruption. As has also become tradition, two marches, each of comparable size, took place — one inspired by the underground Communist Party of the Philippines (CPP), the other consisting of everybody else. Benedict Anderson wrote that the turbulent history of the Philippines gives observers a feeling of “historical vertigo,” and the SONA protests are no exception — they are a dazzling condensation of historical periods. The “broad” march is just that, broad, and includes Marxist-Leninists, progressive NGOs, feminist collectives, and anyone else who cares to join, while the other march, more ideologically homogeneous and representing the “national-democratic” line, seems strangely out of time. Placards and banners denounce the government as the “fascist running dog of US imperialism,” and graffiti urges youths to join the “people’s war” in the countryside. As the SONA protests make clear, the national-democrats remain by far the strongest current on the Philippine left, and while Maoism has largely disappeared in the region, the CPP remains at the head of mass movement. Party membership is in the ten thousands and its armed wing, the New People’s Army (NPA), has thousands of regulars. The CPP’s political line is followed by a wide network of underground and legal formations that reach out to, and organize, millions of Filipinos. The sustained significance of the CPP current, which holds at the core of its worldview the idea that nothing important has changed in Philippine society since 1945, is puzzling. Its rhetoric seems dated, its theoretical framework the same as it was at its foundation decades ago. There are obvious reasons for people to protest the status quo in the Philippines. It has the highest income disparity in Asia and around a quarter of the 100 million Filipinos lives on less than $1 a day. “Torture and other ill-treatment” by the police are rife, and journalists and activists risk being murdered by gunmen who are never brought to justice. Politics and key sectors of the economy are dominated by wealthy families, some of whom have been in power since the Spanish colonial era. The founding congress of the Communist Party of the Philippines wasn’t very promising. Twelve activists met in early 1969 in Luzon, the largest island of the Philippine archipelago. The attendants, who decided that the official date of the congress should be pre-dated to December 26 — Mao Zedong’s birthday — were led by Jose Maria Sison, a young university lecturer and son of landowners. 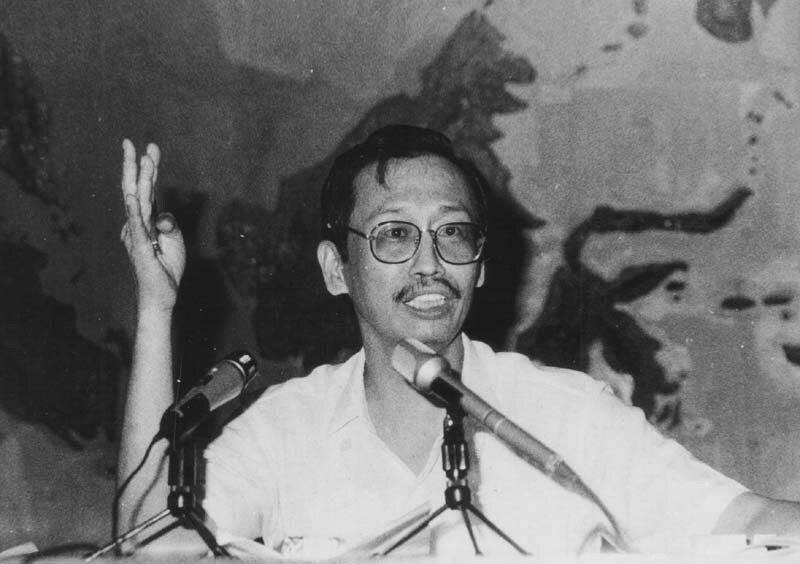 Sison was a member of the underground Partido Komunista Pilipinas (PKP). During the Japanese occupation and after, the PKP led a powerful guerrilla-movement, the Huks (short for Hukbalahap or Hukbong Bayan Laban sa mga Hapon, the Nation’s Army Against the Japanese). But a bid for power by the PKP had been defeated in the 1950s, and most of its leaders were still in prison, leaving the party searching for a way to legally operate again. Sison had been tasked by his party to organize a new youth movement, the Kabataan Makabayan (Nationalist Youth). Protesting social inequality, Philippine support for the US war against Vietnam, and the increasing authoritarianism of president Ferdinand Marcos, the group grew rapidly. Encouraged by their growing movement, Sison and other young radicals soon grew impatient with the cautious course of the PKP, and broke with the party, linking up with a remnant of the Huks to restart the armed struggle. They billed the founding of their CPP as a “refoundation” of the authentic communist party. Sison declared that the economic “backwardness” of the Philippines was “principally determined by US imperialism” which had blocked the “natural development” of a self-sufficient economy, keeping the country in a “semi-feudal, semi-colonial” condition. Sison’s revolutionary strategy flowed directly from this analysis: a rural guerrilla-war along Maoist lines in which a peasant army would encircle the cities and seize power. When president Ferdinand Marcos declared martial law in 1972, he cited the threat of the communist guerrillas as one of his reasons. In reality, the guerrillas numbered a few dozen at the time, even though early 1970 had seen the “First Quarter Storm,” a series of large and militant protests that helped radicalize a new generation of revolutionaries in which the Nationalist Youth and other radical groups played an important part. Marcos exaggerated the strength of the fledgling CPP/NPA, but after he declared Martial Law, the Maoists did actually become the premier force in the anti-dictatorship movement. Whereas other opposition forces were swept away by the repression and the PKP surrendered to the dictator, the CPP had been preparing for underground struggle and was able to keep part of its cadre out of the hands of the state and continue organizing. In the following years, the CPP/NPA grew steadily and cultivated networks across the country. The guerrillas were unable to defeat the state but they provided shelter and a base for organizers who were driven underground. Its continuing attacks gave the lie to Marcos’s claims to have brought stability to the country. Guerrilla attacks, urban protests, strikes, and rebellions by the country’s Muslim minority whittled away support for the regime, and more and more Filipinos saw only two options — Marcos or the CPP-led national-democrats. Marcos’s power rested on a bloc of different forces. Cronies who used their connection with the state to increase their economic power provided important support to his regime, as did the increasingly politicized army, technocrats and the United States. As the Philippine economic situation worsened in the seventies and early eighties, the political crisis also grew, coming to a head with the 1984 assassination of Benigno “Ninoy” Aquino, the leader of the liberal opposition. Marcos called for new elections in early 1986 in which he ran against Corazon “Cory” Aquino, widow of Ninoy Aquino (the current president is the son of Cory and Ninoy). After Marcos rigged the vote, a rebellion broke out in the army, which gathered massive civilian support in the “People Power Revolution.” In February 1986 the dictator fled to Hawaii and Cory Aquino was declared president. Despite its earlier strength, the CPP found itself isolated by the developments of the 1980s. It had called for a boycott of the elections that led to the People Power Revolution — just like it had done for previous elections — but this time, the boycott call went largely unheeded, and even national-democratic activists campaigned for Cory Aquino. The party later criticized the boycott call as a mistake. The boycott was a symptom of a faulty analysis. The party had dismissed the possibility that the ruling class of the Philippines could stay in power other than through a dictatorship. For a long time this was true — for years the liberal opposition seemed unable to offer an alternative, lacking a strong social base and unprepared for repression. But the situation gradually changed. Worried by the growth of the CPP, elements in the US state (especially in the State Department) started supporting the liberal opposition and Marcos cronies started to jump ship. The unraveling of Marcos’s coalition accelerated after Ninoy’s assassination. This shift in US foreign policy had been declared impossible by the CPP which, based on their conception of imperialism, argued that the US needed Marcos to exploit the country. With the restoration of formal democracy under Aquino, most of the middle class that had sympathized with the national-democrats turned their backs on the revolutionaries while many among the movement’s popular base doubted whether continuing the armed struggle was opportune. After his release from prison in 1986 by Aquino, Sison reassumed the role of party chair, but along with other CPP leaders he misread the political situation. The CPP had alienated many of its sympathizers with its boycott call and the movement was also heavily damaged by revelations that hundreds of CPP members and sympathizers had been killed in witch hunts for government spies. In 1987, elite democracy started stabilizing, but as late as 1990 Sison insisted that there was a “revolutionary flow” in the country. CPP leaders thought there were large opportunities for the movement to grow and that the government lacked popular support. The NPA was ordered to launch more offensives. After the breakdown of a ceasefire in 1987 the Aquino government declared “total war” on the rebels and inflicted heavy losses on the increasingly isolated communists. The misfortunes of the CPP led to intense debate, in which Sison played a central role. In self-exile in the Netherlands since 1987, Sison argued that experiments with tactics like urban insurrection and other deviations from the Maoist line had supposedly led to the defeats and demanded a return to the directives of Philippine Society and Revolution. Under a new pseudonym — Armando Liwanag (roughly meaning “Armed with Light”) — he accused his opponents of treason, sending denunciations of them to bourgeois newspapers. Though it came at a heavy price — around half of the national-democratic movement left in the early nineties — Sison’s camp eventually won. Much of the Left in the Philippines, from social democrats to the Marxist-Leninist Party of the Philippines, has roots in the 1990s splits of the national-democratic movement. Collectively, the Left outside the CPP orbit is sometimes still referred to as RJs — short for Rejectionists: those who rejected Sison’s “reaffirmation” of Maoism. The CPP-aligned left are the RAs – Re-Affirmists, and today, the RAs are equal in number to all the RJ groups put together. How did the RAs win the inner party struggle? Part of the explanation lies in the fact that the opposition failed to form a united front: it had agreed about what it was against but not what it favored. Another part of the explanation is the way Sison skillfully used anger over the witch hunts against his opponents — he was in prison during the worst of the killings, though he was certainly aware of the hunts for spies. Prominent members of the opposition had been leaders of the CPP in the southern island of Mindanao, where the majority of the victims were killed, and they carry a deep responsibility for the torture and murders that were part of the so-called “anti-deep penetration agent operations.” Sison tied the crimes of these witch hunts together with political objections to the Maoist strategy as symptoms of a “petty-bourgeois” mindset. The reasoning was axiomatic: whoever follows the Maoist line is a proletarian, whoever disagrees with it is at best petty-bourgeois — and by implication an enemy of the revolution if they refuse “proletarian” leadership. Most importantly, Sison’s insistence that there was no reason to change strategy after the fall of Marcos rang true for many activists, especially those in the countryside. In the cities, the restoration of formal democracy opened up new possibilities for organization and agitation but in the countryside much remained the same. Rural poverty persisted and Aquino’s promised land reforms made little difference. In the countryside there was no decline in state violence, and when Aquino declared “total war” against the Left already in early 1987 human rights violations there increased. Aquino gave a blanket amnesty to perpetrators of human rights violations under Marcos and continued the use of paramilitary groups against the Left. The increased military operations led to a growing number of internally displaced people. In this context, Sison’s call to return to Maoist basics, to the strategy that had supposedly guided the building of the national-democratic mass movement, seemed to made sense to many rural Filipinos. In reality, the movement’s builders had often deviated from the Maoist approach. Early in its history, the CPP adopted a model of “centralized command, decentralized operations.” The idea was that party units should have a large degree of autonomy so that they would be able to continue to organize even if they lost contact with the national leadership. The “central leadership” was embodied in party committees that ensured ideological adherence. This meant that innovations remained at a local level, tolerated as long as they were successful and could be combined with a formal adherence to the Maoist strategy. A Maoist discourse became synonymous with revolutionary theory. Experiences that did not fit the mold remained local, were never theorized nor made part of the official memory of the party and the idea that the rise of the CPP could be attributed to the strategy espoused by Sison remained dominant. As founding chair of the party, who had faced torture and solitary confinement after his arrest in 1976, he still commanded respect. Some of Sison’s prescriptions also made sense. The NPA was directed to retreat, to concentrate less on engaging the army and police and more on organizing. Depending on their skills, the guerrillas provided medical support and education to people, set up mutual aid structures for peasants, and helped them with their daily work. For many veteran rebels, this felt like a return to the kind of work that had enabled the NPA to grow nationwide. By the late nineties, the CPP had stabilized. It had become much more ideologically homogeneous, though it was considerably smaller than it had been in the mid-eighties. It is difficult to determine how large the CPP/NPA is today. CPP statements put NPA strength at over 6,000 but below 10,000, while the Philippine government claims there are 4,000 NPAs left. In 2013, the CPP declared that previous estimates of the size of the NPA in the mid-eighties were incorrect. Fully armed fighters supposedly never numbered over 6,100, far less than the figure of 25,000 many observers had thought constituted the high point of the NPA. The statement was intended to minimize the weakening of the NPA but inadvertently revealed the movement’s weakness. The party’s newspaper Ang Bayan claims a steady increase in the size of the NPA and the number of attacks it organizes, but plays down the losses it sustains. The CPP quietly abandoned its 2009 plan to reach “strategic stalemate,” in which the NPA would be able to match the government army by 2014: more recent statements give a longer, vaguer (five to ten years) time frame in which to meet its goals. Yet the movement retains strong civilian support, as millions of Filipinos support the national-democrats. Underground national-democratic organizations are part of the National Democratic Front of the Philippines (NDFP). The NDFP promotes itself as a united front of over a dozen mass-organizations but is directly controlled by the CPP. The government and the NDFP both declare to be willing to engage in peace negotiations but talks regularly collapse with each side accusing the other of a lack of sincerity. One way to estimate support for the national-democratic movement is by looking at the votes gathered by the legal national-democratic organizations. The Philippine House of Representatives is mostly elected in a first-past-the-post system but 20 percent of seats are elected by a type of proportional representation, and allotted to party lists. The structure is designed to give geographically dispersed, underrepresented groups like poor peasants or women a chance to be represented by specific party lists. Since 2001, national-democrats have been participating with their own party lists, organized in the Bagong Alyansang Makabayan (New Nationalist Alliance) or Bayan. In the 2013 elections, Bayan got a little over 3 million votes, good for seven seats. Obviously, not everyone who votes for this alliance supports the CPP, and it’s also likely that fraud and intimidation by members of the ruling class cost the alliance votes, but regardless, Bayan leads the minority in the Lower House. The CPP electoral strategy is in accordance with the Maoist strategy of a two-stage revolution in which a nationalist, anti-imperialist revolution, in alliance with a part of the bourgeoisie, is followed by a socialist revolution. There are stories circulating in the Philippine left that some CPP leaders feel uneasy with the electoral campaigns since the official line maintains that elections are a sham. Another reason for the unease is the national-democratic approach of allying with whomever offers the best chance to win seats — an approach that in 2010 saw them ally with “Bongbong” Marcos, son of the late dictator, to support millionaire businessman Manny Villar in his bid to win the presidency. Bayan defends a minimum program of wage increases and land reforms but strongly objects to being called “socialist” or “leftist.” While the underground movement talks about socialism and capitalism, the CPP has been intellectually stagnant for some time. When it discusses ideology or theory, the CPP often refers to morality rather than to politics. In the CPP tradition, political education largely refers to emphasizing virtues like the willingness to sacrifice, bravery, and putting the collective first. Its theoretical journal, Rebolusyon , has not been published since the end of 2001, and the party’s general perspective is instead laid out in regular statements in Ang Bayan . These statements, along the lines of “the tide of revolution rises in the Philippines as the economic crisis of the ruling system worsens,” are generally just repetitive calls to “intensify the people’s war.” Thus the paradoxical situation in the Philippines; it is a country with a mass movement led by a Communist party where few people discuss socialism or Marxism. Intellectual stagnancy is often coupled with violence. The way CPP polemics erase the difference between political disagreement and betrayal have cleared the way in recent years for assassinations of other left-wing activists by the NPA, and the CPP regards all other left-wing groups in the country as counter-revolutionary. Since Cory Aquino, each Philippine president has given a deadline for defeating the CPP/NPA — and has failed. Assassinations and disappearances of people suspected to be CPP sympathizers peaked under the previous president when they appeared to be part of a coordinated counter-insurgency drive. Human rights violations continue, although on a decreased level, under the current president Benigno “Noynoy” Aquino III. Much of such repression is on the initiative of military commanders that act with the silent approval of their superiors. But repression has been unable to break the CPP, whose persistence is rooted in the political economy of the Philippines. The Philippine ruling class is fractured and has failed to modernize their country when compared to other countries in the region. Problems such as rural poverty and landlessness are rampant, enabling the CPP to find rural recruits for its armed insurgency. No other left group has anything like the means and infrastructure of the national-democrats, who are still so dominant that they are referred to as “’the mainstream left.” The CPP movement is also financially self-sustaining through measures like the “revolutionary taxes” collected by the NPA. The dominance of the national-democrats means that people who are just getting politicized will often most likely come into contact with them first. This way, the national-democrats remain in a position to capture a considerable part of the social dissatisfaction in the country. Traditionally, the CPP drew many of its leaders from the student movement. In March 2014, the Philippine police arrested Benito and Wilma Tiamzon, the couple that since the nineties had been leading the CPP in the Philippines. Both are veterans of the student movement of the early seventies. The rumored current chair of the party, Rafael Baylosis, is likewise a veteran of the student movement of those days. The CPP gave many martyrs for the revolutionary cause and the armed struggle hasn’t completely lost its romantic appeal. At the same time, despite its intellectual stagnation, CPP ideology remains quite influential. Other currents of the Philippine left produce little theory and often prefer to keep their ideological differences hidden behind a facade of unity. This means young activists have little access to alternative interpretations of socialism and to perspectives that challenge the CPP discourse. In the mid-eighties, the national-democratic movement seemed on the verge of taking power — but today this seems like a distant memory. That the NPA had such a modest size when it shook the power of the state in the 1980s illustrates the importance of the open mass movements and support of the urban working class (what the CPP refers to as the “petty bourgeoisie”) the movement enjoyed back then. But today, the movement is much more rural and isolated than it was at its peak. The NPA is increasingly concentrated in economically stagnant, undeveloped parts of the country such as the northwest of Mindanao, one of the poorest regions of the country. Such regions hold little economic or political interest for the state or for most of capital. Yet, the CPP still sees all fields of struggle as secondary to the rural armed struggle, despite the shrinking proportion of rural Filipinos. In 1990, over half of the Philippine population lived in the countryside; today only one third do. Ultimately, these days the Philippine ruling classes are not losing much sleep over the insurgency. The country remains extremely poor, it’s industrial base primarily low-wage and is comparatively underdeveloped, but finding a job in the growing assembling and service sectors or as an “Overseas Filipino Worker” appears to many educated youths a more attractive prospect than joining a decades-old insurgency. The decline is slow, but despite CPP/NDFP/NPA attempts to forestall irrelevance, “the world’s longest running communist insurgency” is being worn down by the passage of history. But as the SONA protests show, the Philippines is home to a heterogeneous left that reflects a very different experience of social struggle and which continues many of the best traditions of the anti-Marcos resistance. It is here where our hope and solidarity should rest. In the Philippines, one of the world’s longest running communist insurgencies is being worn down by the passage of history.